You may recall my post on using the foot examination to look at the state of my patients’ toenails as an indicator of neglect. Another window is the mouth and the state of a person’s teeth and gums. 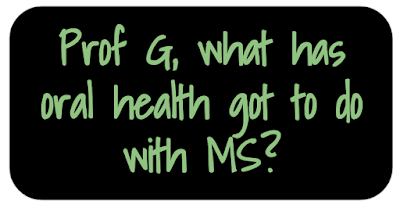 Self-neglect is a problem in MS. But how big is the problem? The study below using an online survey shows that pwMS have a greater oral health burden than the general population; i.e. they experience high rates of toothache, mouth dryness, teeth sensitivity, change of taste and orofacial pain. PwMS also have higher rates of gum, or periodontal, pathology (see previous blog post ‘poor dental hygiene and disability‘). Periodontal disease is a problem as it causes systemic inflammation that is associated with the development of metabolic syndrome and other comorbidities, which may increase the rate of MS worsening (formerly referred to as progression). So why do pwMS neglect oral health? There are many possible reasons, which could include depression, cognitive problems, fatigue, poverty, pain, disability and poor diet and smoking. When you are depressed everything seems worthless. When you have suicidal thoughts the last thing you are going to be doing is worrying about the state of your teeth and gums. When you have memory problems you may simply forget to brush your teeth, use dental floss or go to your oral hygienist. If you are unemployed (probably because of your MS) you may simply not have enough money to purchase what is required to look after your mouth. If you are incapacitated by MS-related fatigue it is easy to understand why brushing your teeth, flossing and seeing a hygienist fall off your ToDo list. If you have trigeminal neuralgia or atypical facial pain, both of which are quite common in pwMS, you are not going to be doing anything that exacerbates your pain. If you are losing, or have lost, hand function and battle to manipulate your toothbrush it may be easier to skip oral hygiene procedures. In our MS population in London the average diet is not good at all; far too much-processed carbohydrates that are bad for your teeth. In addition, pwMS still have high rates of smoking and smoking causes oral health problems. As you can see MS causes collateral damage that is not limited to the nervous system. Can I suggest that HCPs looking after pwMS make it their duty to look into the mouths of their patients to see if anything needs to done around oral hygiene? Or is this a step too far for the MS team? 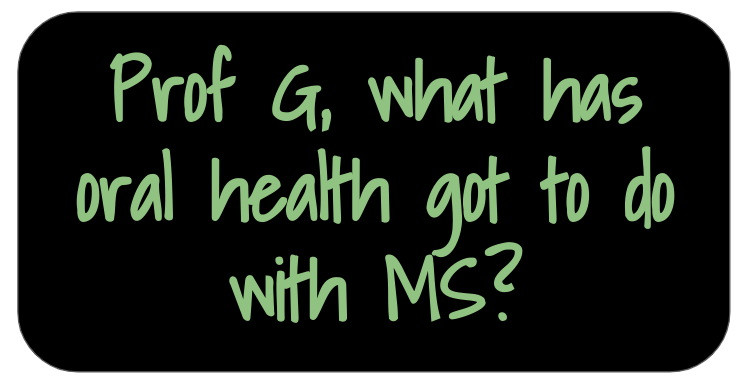 Surely the holistic management of MS should include oral health? In addition to the state of one’s toenails, I think we should add oral health, to any potential future MS Self-Neglect Index. Self-neglect and its manifestations are another reason to #ThinkSocial in 2019. Sexton et al. Oral health and behaviours of people living with Multiple Sclerosis in Australia. Community Dent Oral Epidemiol. 2019 Jan 7. OBJECTIVES: The literature describing the oral health of people with Multiple Sclerosis (MS) is scant and the findings equivocal. The aim of this study was to describe the oral health and oral self-care behaviours of people living with MS and compare it to the Australian population. METHODS: Participants enrolled with the Australian MS Longitudinal Study (AMSLS) were invited to participate in the survey using an online or paper-based questionnaire. Data were collected on level of disability, oral health, oral self-care and factors influencing attendance for oral health care. RESULTS: Completed questionnaires were received for 1523 respondents. Over one-fifth (n = 320; 22%) rated their oral health as fair or poor, and more than half (n = 840; 57%) reported toothache in the last 12 months. These proportions were higher than those for the general Australian adult population (oral health prevalence ratio (PR) = 1.25 [1.12, 1.40]; toothache PR = 3.63 [3.39, 3.88]), and this is despite comparable or better self-maintenance habits and dental attendance reported by respondents. People with MS reported high rates of mouth dryness (68.4%), teeth sensitivity (64.7%), change of taste (40.5%) and orofacial pain (39.0%); fewer than 10% experienced none of these. There was a lower prevalence of self-reported need for treatment (extraction or filling) than in the Australian adult population (15.8% vs 32.9%). CONCLUSIONS: People with MS have a greater oral health burden, demonstrated by their poorer self-reported oral health than the Australian adult population. Furthermore, they experience high rates of toothache, mouth dryness, teeth sensitivity, change of taste and orofacial pain. These findings are contrary to their self-reported good oral self-care and dental attendance habits and suggest some of the oral health impacts are due to MS rather than dental behaviours. Then there's problems with eyesight such as double vision or blurred vision leading to not being able to see all teeth. Prof G, Why have you got so much time on your hands? It's either feast or famine with you. At the moment you are making MD seem like a slacker. If you do have a spare few minutes could you put some bullets points together on what might be happening in 2019 i.e. any big trials results expected this year (e.g. something on repair or stem cells), any conferences where we might hear some breakthrough / interesting news. Thanks. Not true; I am time poor. Just ask my wife. Dont bite the hand remember you had 6 weeks without one single post. Be happy there is content..I am. Those fingertip toothbrushes for adults might be suitable for pwMS. Less need to open your mouth wide, if you have facial nerve pain and you can feel your way around your teeth more, if you can't see well in the bathroom mirror. Correlation is not causation. PwMS have lots of abnormal medical symptoms. Maybe some of them point to the pathology or vector of the disease. Jumping to conclude PwMS don't brush or floss seems pseudo-scientific. It's all manner of things. Hair appointments, smear tests, GP appointments. It can be hard getting past the feeling that you will be putting someone out by asking them to take you and then trying to sort out an appointment that works for all parties, the logistics can seem overwhelming, so you leave it. Especially if you are tasked with organising things for children, as parents we tend to put our energies into them first. Thank you for the fingertip toothbrush idea Anonymous I am finding it hard to manoeuvre a regular brush. "These findings are contrary to their self-reported good oral self-care and dental attendance habits and suggest some of the oral health impacts are due to MS rather than dental behaviours." Does this not indicate that MS, i.e. the disease itself, is having some impact? Linked to some problem with vD metabolism perhaps – increasing both MS risk and weaker teeth due to reduced calcium absorption? Or could DMTs be having an effect? E.g. was it not mentioned on this blog some time ago that Tecfidera can exacerbate gum recession? Could be a multitude of things. Separating out association from causation is not easy. This is not my field and those concerned need to do the intervention studies. A very interesting post; I am sure self-neglect may be linked to cognitive impairment.